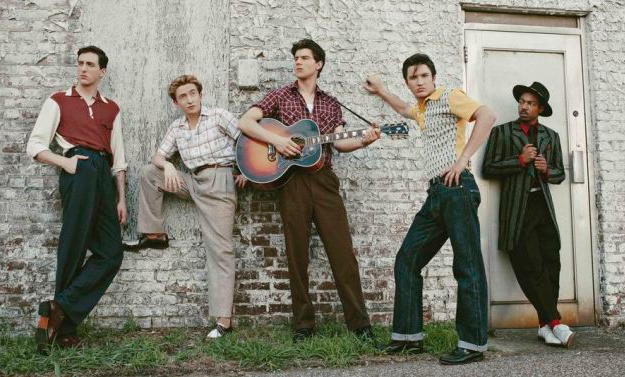 A show that gave a fresh shot in the arm to the legacy of Sun Records and artists like Johnny Cash and Jerry Lee Lewis will not be renewed for a second season. CMT’s series Sun Records has been canceled after an eight episode run behind the network’s now signature series, Nashville. Starring Chad Michael Murray, Billy Gardell, Drake Milligan, Kevin Fonteyne, Christian Lees, Jonah Lees, with cameos from folks like Pokey LaFarge playing Hank Snow, the series was set in Memphis during the birth of rock and roll at the iconic studio landmark the show was named for. According to CMT’s head of development, Jayson Dinsmore, fans should be happy they got as many episodes as they did, while also saying the series was a success in its short run, and leaving open the possibility of a return. Sun Records averaged a 0.13 rating in the 18-49 demographic, and 585,000 viewers per episode. Though these would be low numbers for a network television show, they fall into the average viewership for a CMT series. The Sun Records series, and Nashville‘s move from ABC were part of a change in strategy from CMT to distance from the controversial reality series Party Down South, and instead focus on television that catered more to their conventional demographics as “Country Music Television.” Though Sun Records was never a ratings king, it found a lot of positive reception with old school country and rock fans. Jerry Lee Lewis and other living members of the original Sun Records scene praised the show. Coming back to CMT are the Billy Ray Cyrus-led show Still The King, the unscripted I Love Kellie Pickler, among other shows. I loved the series, and as a fan of Jerry Lee Lewis and the rest of the Sun artists, I discovered things about their story that I never knew before. The way they developed Sam Phillilips character was especially fascinating. The boy who did Jerry Lee’s part did his homework well, but if they bring the show back in the future, they need to use a character who is a litllr taller. and can project an air of danger when called for. Afterall, JLL was the original outlaw and bad boy of Rock and Roll. To the CMT execs, PLEASE bring this show back! The story needs to be told at least up until 1958, when Jerry’s mercurial career was snuffed out by his marriage to 13 yr. old Myra, and the rest of the Sun artists left the label.